Hmm? Is there something wrong with being excited for such an achievement? Or maybe I just like kazoos. Anyway, here is a recap of the events. Trillion - a very big number. For you smart readers out there, it’s a one followed by twelve zeros. Think of it this way - if you went to the Wheel of Excitement every two hours and won the grand prize of 20,000 NP every time, it would still take you over ten thousand years to earn a trillion Neopoints. Yeah, it’s a pretty big number! FTW - An abbreviation for “For the win!” An appropriate title - one trillion page views is certainly a reason to celebrate! For those who missed it, here’s what happened - for the rest of that week until Monday the twentieth, users could receive, either through lighting-fast reflexes at the auctions or sheer luck at the Trading Post, one of the countless treasures given away by TrillionFTW. These items ranged from priceless to downright bizarre. Some of these items, previously unattainable due to their exorbitant price tag, are now within the reach of aspiring Battledomers, avatar hunters, or oddity collectors. While most did not get anything, several winners earned unimaginable wealth, achieving a fortune overnight. Weapons, retired items, morphing potions - there was no limit on what TNT would give away. Here is a run-down on ten of those items. Ahh, Meowclops - the adorable one-eyed Petpet coveted by so many avatar collectors. Released on the last day in the trades, several lucky Neopians are now the owners of these rare and fascinating creatures and can now unlock that somewhat disconcerting avatar for the Neoboards. Congrats! 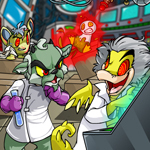 Shameless plug aside, TNT, as stated in last week’s editorial, wanted to lower the price of these morphing potions and eggs so that more Neopians could get their dream pets - the elusive Krawk or Draik! Rare and (more importantly) very shiny, the Jewelled Scarab is a marvel in the Battledome, restoring all lost hit points to the weary user once per battle! This item, given away as a prize for an old plot, can finally find its way into a user’s dream Battledome set, gallery, or onto their specially designed Jewelled Scarab Pedestal. Huzzah! Desired both for its incredible power in the Battledome and as the source of a rare avatar, the Super Attack Pea, once released only in the Smuggler’s Cove, recently made a reappearance on the face of Neopia. I would suggest not getting in a fight with someone who won one of these! Anyone who has ever stepped into the AC board knows how much this little TCG card is sought after. Still, the debate rages on - is it pronounced “Ehm-ess-pee-pee,” or is it something like “Mssssssppp,” said in a loud, hissing voice? We may never know. Technically a weapon that deals about six icons of damage, this item is really coveted for the avatar that can be attained through it. Not only that, but it looks really cool. Caution: Do not feed to your Grarrl! This item is a legend in the Battledome - shielding some damage, dishing out a hefty blow, and having a one hundred percent success rate of freezing your opponent! These were rarely (if ever) seen in the Battledome before, but with the celebration, I would be careful now before accepting any BD challenges. On Monday, a strange new creature was seen wandering around Neopia - a Kau appearing to be made of nothing but swamp gas. If you were fortunate enough to attain one of these paint brushes on the last day of the celebration, you could try taking your Kau to the Rainbow Pool and see what happens. A word of advice, though - bring nose plugs! Considered by many to be a fable, this odd item made an appearance in the grand finale of the giveaway on Monday - the final treasure traded away during the celebration. Once sold in the Hidden Tower for a price that was considered expensive even back then (oh, inflation! ), if one of these still exists from before, it is most likely gathering dust in someone’s Safety Deposit Box. A strange power seems to emanate from this, and to the anonymous Neopian who won this, well, I would be careful at night. Who knows what Hubrid’s ghost has been up to lately? As a side note, if you were watchful, you may have noticed throughout the course of the celebration an odd replacement for Punchbag Bob in the Battledome. If you have any information on these strange sightings, contact your local authorities at once! And with that, I bring my summary to a close. If you were one of the few Neopians who claimed something from the giveaway, congratulations! If not, then cheer up! Perhaps your time will come... who knows, maybe your luck will change for the two trillionth page view celebration! Hannah's jaw dropped. "I don't want your autograph! Do you seriously not know who I am?"